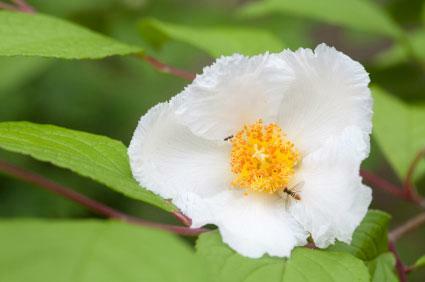 Stewartia (Stewartia spp.) 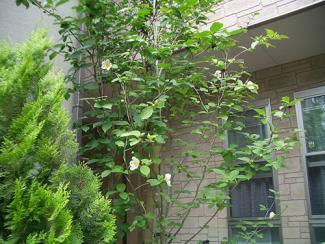 is a small group of flowering trees and shrubs closely related to camellias. Though not commonly found in nurseries, they are exquisite ornamentals worthy of seeking out. There is a handful of stewartia species available though they all share similar characteristics and growing requirements. Stewartias are known for their large, one to three-inch flowers in summer that resemble white camellias: they have a cup-shaped crown of ruffly petals on the outside with a prominent cluster of yellow stamens in the middle. 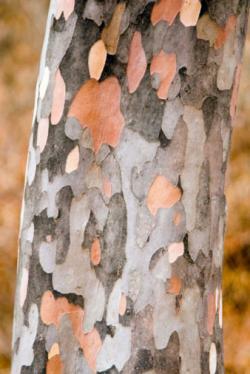 They are also known for their fall foliage, which ranges from bright red to deep purple, and their unique textured bark that creates winter interest with its mottled, peeling appearance. Some stewartias can be maintained under 10 feet in height as a hedge, but most grow to small trees with an upright, pyramidal growth habit. Stewartias grow in sun or shade. Flowering is more abundant in sun, but in hot climates they perform better with afternoon shade. They prefer rich, moist soil, but will tolerate a bit of neglect once established. Their one critical growth requirement is acidic soil. Stewartias have a dense growth habit, making them suitable for a tall hedge, but they are such striking plants that it make sense to showcase them as specimens. Use them as a focal point in a lawn or amid a bed of smaller shrubs and perennials or to create formal procession lining either side of a walkway or driveway. They are one of the best understory trees for a woodland garden alongside other small shade tolerant trees, such as Japanese maple. 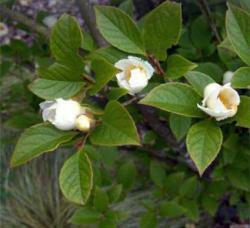 Plant stewartia from containers in fall or early spring, mixing copious quantities of compost into the planting area. If necessary, amend the soil with peat moss or sulfur to make it acidic. Water on a weekly basis for the first couple of years to get the plants established. Once established, deep waterings every few weeks will suffice. Maintain a deep layer of mulch over the root system to keep them cool, conserve moisture and restrict weed growth. Stewartias generally take on an attractive shape without pruning, but they are very amenable to pruning and shaping if desired. Removing the lower limbs as they grow reveals their attractive trunks and bark. The smaller varieties can even be sheared into a formal hedge. Stewartias are generally free of pests and diseases. Stewartias are not commonly seen in retail nurseries, but several species can be found in mail order nurseries. Japanese Stewartia (Stewartia pseudocamellia) grows up to 40 feet tall and 20 feet wide with 2-1/2-inch blossoms; it's hardy in USDA zones 5 to 9. Korean Stewartia (Stewartia koreana) is a little smaller than the Japanese variety, but has slightly larger blossoms; grow it in USDA zones 5-8. As a tree version of its cousin the camellia, it's a wonder that stewartias are not more widely grown. Perhaps they will one day emerge from horticultural obscurity, but if you're lucky enough to have one, enjoy the privilege of knowing a true underdog of the plant world.